When we moved to Leesburg, no one told us how different Halloween would be. Here, on “All Hallowed Eve”, children dress in their costumes, lining the streets of downtown Leesburg, to collect treats thrown to them from passing parade floats. The parade is put on by the local Kiwanis club, and this year, everyone in attendance was asked to bring a canned food item to help fill our local food banks. Most floats are sponsored by local businesses, who are having a little fun promoting their business and giving back to the communities they serve.I’m told that the Leesburg Halloween parade is the longest running in the country, which I think is kind of neat. I love to see old traditions remain strong. Here in Leesburg, I see no danger of this tradition ever going out of style. Every Halloween, if you live in Leesburg, you go the parade. EVERYone’s there. You’re IN the parade or AT the parade, but you’re there. Now that we’ve been here 8 years, we’re finally getting the hang of it.In fact, the last 2 years, I’ve been IN the parade; on a float with my brokerage office, Keller Williams Realty of Leesburg. Last year, I drove our float - and it was among the most frightening halloween experiences I've ever had! You try driving a float while dodging 5 year olds who are playing chicken with your truck to get a Reese’s! This year, I opted to walk along side the float, giving out candy, being careful to reward those children that obediently stood by their moms, despite the greatest of temptations. So, did you see us? What did you think? We didn’t win any awards… but we thought it looked great. Can you believe our broker (Rick Cockrill) actually had these houses “lying around” as leftovers from a 4-H project he’d done with his son? It was a very easy assembly for us… and special thanks to local J & M Market on Rt 15 (think Pumpkinville) who donated all pumpkins, mums, corn stalks and more. This year, our float was promoting a new web site launched by own of our very tech savvy agents, Steve Lieby. If you haven’t seen it, you should check it out…www.callloudouncountyhome.com/. I can not imagine how cool it would have been to have this parade experience as a child. My 2 and 5 year olds left the scene with bags FULL of candy! Pre-teens and teenagers can still get candy without being those annoying kids without costumes at your door on Halloween. I think it's fabulous. 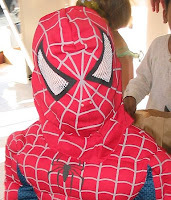 By the time we returned home, two year old Spiderman was done for the night. 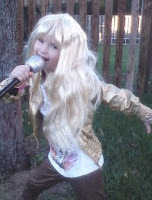 Hanna Montana, on the other hand, had to take to the streets to see her fans. Lucky for her, trick or treating in Leesburg starts AFTER the parade. Lucky for me, it doesn’t last long.